Intensive fighting with heavy artillery and airstrikes continued unabated in Benghazi since Haftar and the LNA initiated Operation Doom two weeks ago. Simultaneous attacks continued to be delivered on all fronts, in the al-Sabri, Leithi, Suq al-Hout, Hawari, Sidi Faraj, Gwarsh and Wast al-Balad districts. Continuous aerial bombardments included the targeting and destruction of 3 vessels of the coast of Benghazi which the LNA said was carrying weapons and supplies to the terrorists still holed up in Benghazi. In a sign of discipline, a number of boats were also permitted by the LNA to depart these areas via the port, which were carrying families that had remained in their areas unable to depart. Considerable gains were made throughout the city and the LNA continues to advance especially towards the port. 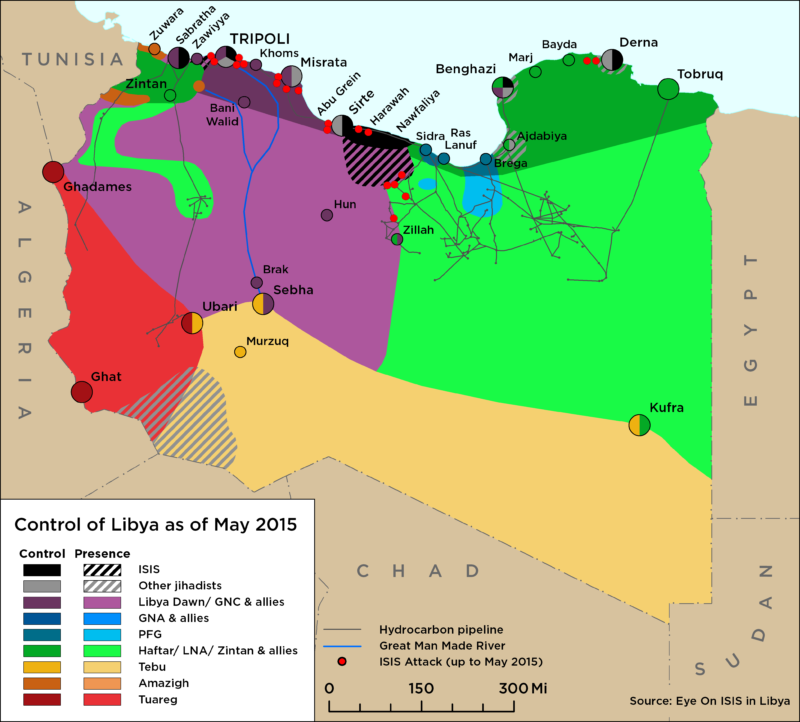 These achievements have prompted a number of local security directorates in the east of Libya to issue a statement declaring their full loyalty and affiliation to Haftar, announcing a boycott against the Interior ministry of the legitimate transitional government led by PM Thinni. While a tenuous cooperation exists to some degree between DMSC and LNA forces, these latter commanders have come under very intense criticism from the military establishment and local tribes with loyalty to Haftar. LNA units under the command of Major Muftah Omar Hamza and Colonel Mohamed Bughafir came under fire for coordinating their operations and attacks with the DMSC to remove IS militants from the countryside to the South-East of Derna. This provoked an angry reaction from Col. Bughafir who appeared frustrated and angry in a video filmed a few days ago with a number of tribal representatives who had come to bridge the gap between the colonels unit and the Military. The colonel further questioned Haftar’s motives and the methods employed by the LNA in combating IS and rejected alienation of non-terrorist elements of his Islamist counterparts in Derna. This questioning of Haftar and the general show of intransience enraged Haftar and LNA loyalists. Currently, local forces loyal to Jadhrans Petroleum Facilities Guard (PFG) are massing in Ajdabiya and Ras Lanuf to protect the area and installations from further attacks, and taking front positions on the western gate of Sidra. A large contingent of the Magharba tribe have left their positions in Benghazi opting instead to defend their tribal home area in the oil crescent. Reports indicate that IS changed its local commander (Ali Gaem) in the Noufaliya area with another non-Libyan commander due to the refusal of the former to attack the ports in the Oil crescent Sidra and Ras Lanuf. Ali Gaem is known to be a close friend of Salem Jedran, the head of the local council of Ajdabiya and brother of Ibrahim Jadran commander of the PFG since they belong to the same Magharba tribe. Sources say that both commanders Jadran and Gaem had an agreement not to encroach on each other’s territories, whereby Jadran does not move his forces west to Noufliya and Ben Jawwad, and Gaem does not attack the oil ports. 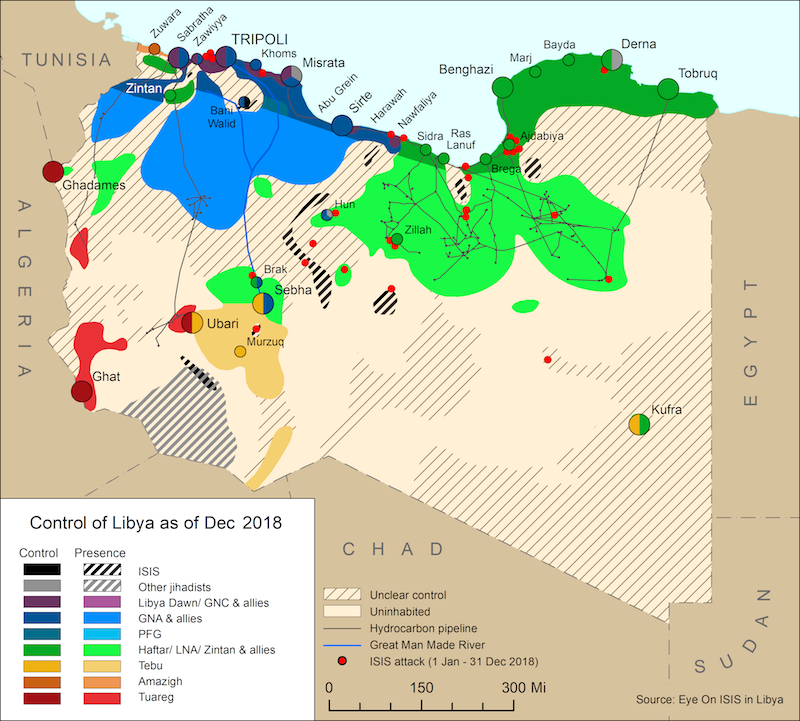 However due to the commander of ISIS in sirte, Hasan Al Kurrami’s intent to attack the oil crescent the Gaem was dismissed and Jadran began to amass his forces in Ras Lanuf last week.